The Iraqi military is maintaining that it has successfully relieved the town of Amerli (pop. 15,000) in northern Iraq from a siege by ISIL (the so-called Islamic State of Iraq and the Levant). If true, this is the first success of the Baghdad military against ISIL since Mosul fell in early June. 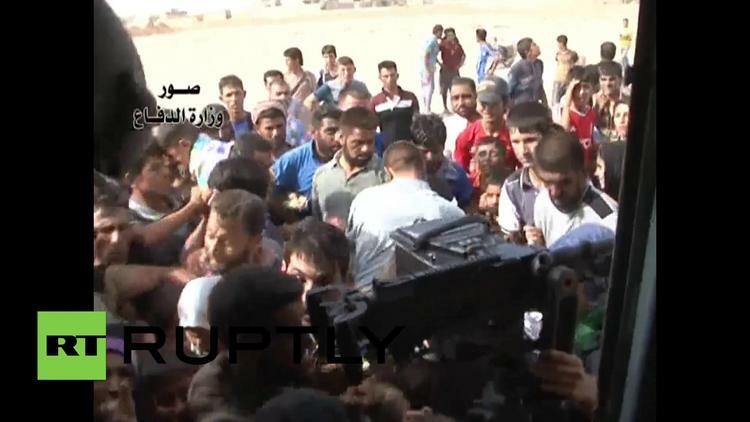 Repeated attempts to move up from Samarra and take Tikrit have failed. But the operation in Amerli is said to have pushed ISIL back into the western desert. Units of the Kurdish Peshmerga paramilitary also fought in the operation, as did Shiite militiamen. 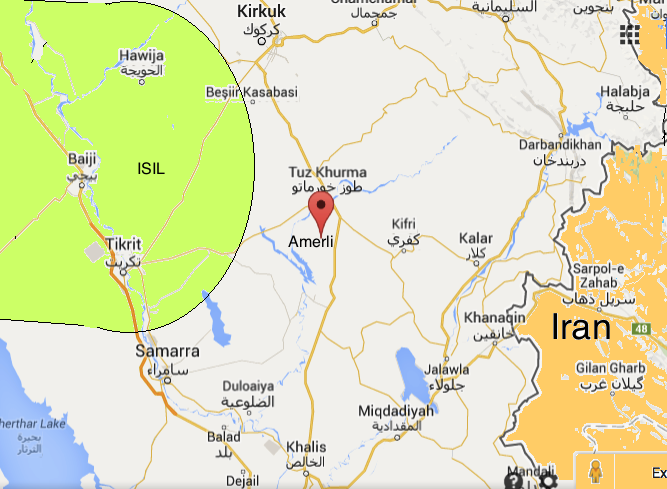 Amerli lies about 100 miles northeast of Baghdad. According to al-Arabiya, Iraqi military spokesman Qasim Ata said Sunday morning that the Iraqi army had entered Amerli and broken the ISIL siege of the Turkmen Shiite town. He said that the army had entered Amerli from the southern village of Habash, and that a further three columns were converging on the town from other directions, amid heavy fighting. On Saturday, a Pentagon spokesman said that the United States had strafed ISIL positions around Amerli and had air-dropped humanitarian aid to the besieged town. The operation Saturday had been directly authorized by President Barack Obama, who had returned to the White House Friday evening and spent Saturday morning directing the operation. Peshmerga commander says there is still very heavy fighting in Khasa Darli village northeast of Amerli. Also still fighting in Suleiman Beg. The fanatics of ISIL, called Salafi jihadis, view Shiites as wretched heretics deserving of death. They had earlier attacked the Yezidi minority in the north, which fled in the hundreds of thousands to Syria. There are about half a million Turkmen in northern Iraq. They speak a dialect of the Turkish spoken in neighboring Turkey. They are evenly divided between Sunnis and Shiites, though previously their Shiism was not orthodox. Many Turkmen Shiites have converted in recent decades to orthodox Shiism of the sort practiced in southern Iraq and in Iran. The three immediate front lines in the struggle to push ISIL back out of Iraq are Diyala Province to the east, al-Anbar Province to the west, and Salahuddin province just north of Baghdad. Amerli is in southern Salahuddin. If the Iraqi forces had the victory they claim there, it appears to have been a result of a combination of forces. US air strikes softened up ISIL on Saturday. Kurdish Peshmerga joined the fight. Thousands of Badr Corps militiamen, originally trained by Iran and associated with the Shiite political party, the Islamic Supreme Council of Iraq, joined in the fight. These are essentially Arabic-speaking counterparts of the Iranian revolutionary guards. Salaam Brigades of Muqtada al-Sadr are also said to have been involved. Amerli, though, may not tell us so much about the battles to come. It is a largely Shiite town, so the esprit de corps of the Iraqi Army and the Shiite militias was bucked up by the prospect of rescuing it. Apparently the same enthusiasm is not there for reducing a strongly Sunni town like nearby Tikrit, where the local population would be hostile to a Shiite-Kurdish-Baghdad Army conquest.